POSTED Wed, 04/12/2017 - 16:00 | POSTED BY Traci C.
Happy Wednesday! In today's news we're talking about the new e-book from our friends at the Disney Food Blog, Easter happenings at Walt Disney World Resort, and a new fundraiser for Star Wars: Force For Change. Let's check it out! POSTED Thu, 05/15/2014 - 05:00 | POSTED BY Traci C.
The Animal Kingdom's afternoon parade is coming to an end this month. Mickey's Jammin' Jungle Parade is reportedly ending on May 31. This will be the second Walt Disney World park parade to end this year. Earlier in 2014, the Celebrate a Dream Come True parade ended at the Magic Kingdom to make way for the Festival of Fantasy Parade. When the Disney Festival of Fantasy Parade debuts at the Magic Kingdom on March 9, guests will have a chance to see some of the most elaborate parade costumes ever created by Disney. The parade is a celebration of Fantasyland, and is the first in a new generation of Disney parades and includes new technology, a new musical score, and floats that are three stories tall. The Celebrate a Dream Come True parade is coming to an end, and the Disney Festival of Fantasy Parade is taking its place early next year. 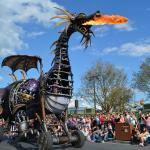 A brand new parade will march its way down Main Street U.S.A. at Disney's Magic Kingdom in the spring of 2014, according to an announcement made at the "Monstrous Summer" press event.